The RV Indochina Pandaw gives you a luxurious and comfortable way to cruise to a range of beautiful Asian locations. 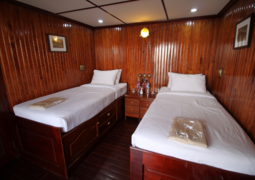 All cabins on board are spacious and finished in teak which makes it a perfect place to spend your trip. You will find a luxurious and comfortable space to call your own for the duration of your cruise. The Cabins finished in brass and teak are not fitted with modern amenities but are designed to be a perfect place to relax in peace and embrace the regions you cruise to. French windows open up onto the walk-around deck with your own wicker table and chairs to sit back and enjoy the beautiful Asian landscapes. The dining room on board the Indochina Pandaw serves a mix of local cuisine and exotic foods prepared with ingredients which are sourced as locally as possible. There are also European dishes served on board so that all passengers will be able to find something they will enjoy. The dining room is designed to open up along the sides to allow passengers watch the views as they cruise, while at night they close up to allow a more intimate dining venue. There is a number of social activities to be enjoyed during your time on board, from the welcome and farewell dinners to the cocktail parties on deck sure to keep everyone entertained. There will also be a number of cultural performances on board which will help to fully immerse yourself on this culturally enriching tour. Themed movie nights are also popular with a number of local films being shown.